The guided tour takes place at 10 am, 10:30 am, noon and 5:30 pm every day. The best time to be in the Park Guell is around sunset. We are comparing Fast Track: Park Güell Guided Walking Tour Prices from leading ticket suppliers and Try to find you Cheap tickets prices on the market. A 1:30-hour guided tour of one of the most famous attractions in Catalonia and Europe. Located on elevated ground with many viewpoints, the iconic site of Barcelona offers spectacular views of the city and the Mediterranean Sea. A journey of discovery unveiling how a project that ultimately failed became one of the most recognizable and colorful public areas in the world. A tour of the place that combines mythical, otherworldly and religious elements. The tour is suitable for every guest, regardless of their age, physical shape and interests since it offers much in many ways. Joining the guided tour is especially beneficial to fans of art and Antoni Gaudi. A tour and a visit to Park Guell unlock secrets of many mysteries, which makes discovering of the site entertaining and informative. Your Experience With Fast Track: Park Güell Guided Walking Tour? Examine stairways, columns, mosaics and various works of art straight from the fairy-tale. Witness the scale of Gaudi's genius and the way he combined imaginative objects into the natural surrounding. Appreciate an incredible embodiment of the Catalan Modernism. Take postcard photos of the Park Guell with Barcelona and the Mediterranean in the background. Avoid waiting in lines and explore the park at your leisure when the guided tour ends. What Fast Track: Park Güell Guided Walking Tour Includes? A guided tour by an experienced and professional guide. An entrance ticket to the Park Guell. Fast-track entry so you can spend more time for a visit. If you arrive at Park Guell by car, make sure to reserve the parking space well in advance. Given that you intend to stay in the park well over the duration of the tour, bring sufficient quantities of water and snacks. Wear comfortable footwear because you are likely to walk a long time during the guided tour and afterward. Travelers Reviews about Fast Track: Park Güell Guided Walking Tour? Some participants in the tour say that guides speak a few languages besides English and Spanish, including Portuguese. Travelers state in their comments that the priority entry is a great and welcoming addition to the guided tour. 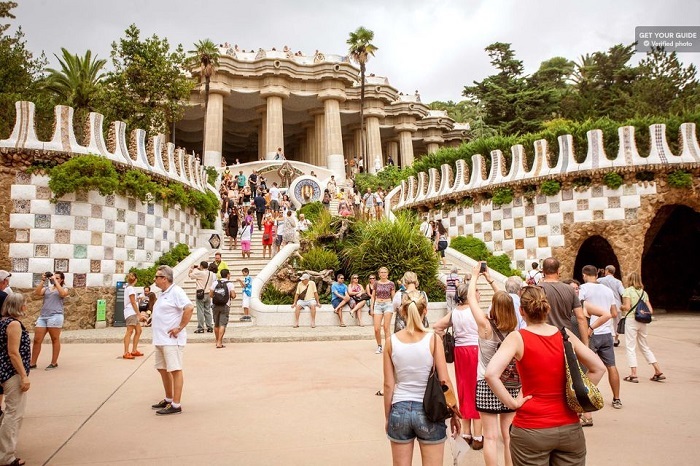 A significant number of vacationers think that crowding of the Park Guell is the site's main downside, but those that joined the tour state that guides handle the situation well. Some comments indicate that knowledge of either Spanish or English is the most beneficial for attending the guided tour. The tour and a visit to Park Guell aren't suitable for visitors suffering from disability issues. Both mobile and printed tickets are valid for this type of activity. Depending on the provider, you may cancel your order between 1 and 3 days in advance for a full refund. The guided tour departs from various points in regard to the day and month. You should arrive at the meeting point at least 15 minutes before the beginning of the tour. Wear comfortable footwear suitable for prolonged walking.